Summer ! Beach ! Shirahama ! It was very hot today too, but more humid than yesterday. "Ok ! Let’s go to the beach, baby !!" I went to the nearest beach, "Shirahama Ohama" with my son, Yuuki this afternoon. 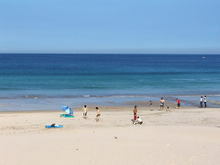 When we arrived at the beach we could see that most of people wearing the swim suit were swimming……. This entry was posted in beach, Family on 2006年6月29日 by izusakuraya. I found it in the train !! In these days we had sunny days like a summer in Shirahama, but it was very humid today. By the way I took this picture from inside Izukyu train. 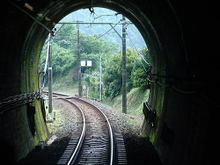 This train was going toward Rendaiji station after this tunnel. When I came from Nagoya to Shimoda station on June 24th, I found it in this train……. 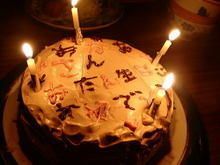 This entry was posted in Family, Travel on 2006年6月28日 by izusakuraya. This month is my wife’s birthday, so my daughter had been saying for a long time "I want to make a cake for Mam!". But we were very vusy in these days, so we could do it today. Look at this cake ! This entry was posted in Family on 2006年6月26日 by izusakuraya. A preparation for summer !! In these days we are preparing many things for this summer ! 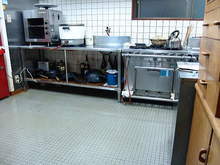 Today I cleaned up the floor of kitchen to work in a clean place. I am going to clean up the refregerator tomorrow. This entry was posted in Pension Sakuraya on 2006年6月21日 by izusakuraya. 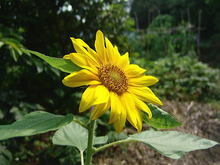 At last the first sunflower in our garden bloomed. Every year we can see this flower from this season, so when we find it we feel that a summer is coming soon. By the way I got plums in our garden today. We have 3 plum trees there but one of them didn’t have many plums ……. This entry was posted in Flower, Pension Sakuraya on 2006年6月20日 by izusakuraya. Today it was really hot !! When I was standing in the beach I was dizzy a little. By the way "All Japan Students Championship" finished today. This picture is its ending ceremony. Unfortunatly in these 3 days it was rainny yesterday and they didn’t have good condition of waves. When I was taking pictures a couple was near the beachside….. This entry was posted in beach on 2006年6月19日 by izusakuraya. 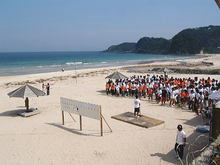 From today "35th All Japan Students Surfing Championship" is taking place at Shirahama beach for 3 days. Last nigh it was strong rainny but almost cloudy today. However the condition was not so good. This entry was posted in beach on 2006年6月17日 by izusakuraya. You want to write anything ? Next month my son will be 1 year and 10 month. 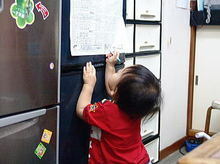 Recently he wants to write something on a paper. "What are you doing, yuuki ?" Sometimes he asks his sister to prepare a paper on a table and writes some pictures. This entry was posted in Family on 2006年6月16日 by izusakuraya. So today’s my mission is "Vegitable meat ball for my son". I prepared many kind of foods from a refrigerator….. . This entry was posted in Family, Meal on 2006年6月15日 by izusakuraya. I was going to post this phot last night, but I couldn’t do it. Because the internet server didn’t work well. It was almost sunny today after a long time. The temperature was higher and higher, so it was just summer ! In the beach there were some surfer, but they didn’t have a good wave. 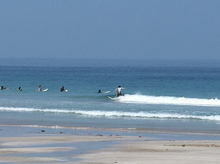 This weekend All Japan Students surfing championship will take place here in Shirahama. But how will be the condition ? ….. 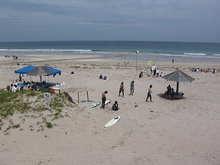 This entry was posted in beach on 2006年6月15日 by izusakuraya.